We’d love your help. 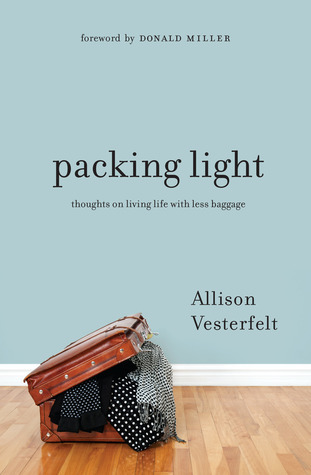 Let us know what’s wrong with this preview of Packing Light by Allison Vesterfelt. When I was in college, I figured my life would come together around graduation. I'd meet a guy; we'd plan a beautiful wedding and buy a nice house-not necessarily with a picket fence, but with whatever kind of fence we wanted. I might work, or I might not, but whatever we decided, I would be happy. When I got out of college and my life didn' What do you need to leave behind? When I got out of college and my life didn't look like that, I floundered around, trying to figure out how to get the life I had always dreamed of. I went down so many different paths for it. Career. Travel. Friends. Relationships. But none of them were as satisfying as I hoped they would be. Like many twenty-somethings, I tried desperately to discover the life of my dreams after college, but instead of finding it, I just kept accumulating baggage. I had school loans, car payments, electronics I couldn't afford, a house full of mismatched furniture I didn't love but that had become my own, hurt from broken relationships, and unmet expectations for what life was "supposed to be" like. Just when I had given up all hope of finding the "life I'd always dreamed about," I decided to take a trip to all fifty states...because when you go on a trip, you can't take your baggage. What I found was that "packing light" wasn't as easy as I thought it was. To ask other readers questions about Packing Light, please sign up. I will start by saying that I am seriously not the intended audience for this book and if I had read the description a little bit more carefully, I wouldn't have picked it up. It is much more explicitly Christian than I would have liked and I really don't care about this woman's journey to God. I was expecting a book about adventures traveling around the US and inspiration for more road trips in my future (although I haven't driven through all 48 contiguous states I have driven across the US twic I will start by saying that I am seriously not the intended audience for this book and if I had read the description a little bit more carefully, I wouldn't have picked it up. It is much more explicitly Christian than I would have liked and I really don't care about this woman's journey to God. I was expecting a book about adventures traveling around the US and inspiration for more road trips in my future (although I haven't driven through all 48 contiguous states I have driven across the US twice and up and down the East Coast many times). Instead, I got a book about two young, white, upper middle class women who had the personal resources to quit their jobs for a 6 month road trip and the community resources to ensure that they almost never had to stay in hotels talking about how "hard" it was to do and how "brave" they were to do it. With the added overlay of how much God was helping them in their "difficult journey," I mostly just got fed up. I kept hoping the book would get better, but it didn't. The shortness of the book allowed me to finish it as I kept hoping. I expected to really enjoy this book, so I myself am surprised at my low rating. I'm willing to admit this may be in part because I listened to the audio version (hey, it was free). I don't typically do audio, and after this I probably won't try it again. The reading of it seemed surprisingly...disconnected, I guess, would be the word. It was how I would imagine I would read the book. But the author herself did the reading. It's her own story, so I expected her to have more of a connection, more I expected to really enjoy this book, so I myself am surprised at my low rating. I'm willing to admit this may be in part because I listened to the audio version (hey, it was free). I don't typically do audio, and after this I probably won't try it again. The reading of it seemed surprisingly...disconnected, I guess, would be the word. It was how I would imagine I would read the book. But the author herself did the reading. It's her own story, so I expected her to have more of a connection, more emotion, in her voice. Other than that, the main reason Packing Light was not my favorite was the story aspect of the book. The pace really dragged at points. There was also a lot of telling, rather than showing. A lot of "I was nervous" instead of "my heartbeat quickened" or what have you. I also didn't understand why a good amount of the story focused on Ben, her boyfriend at the time. I get he was part of the story, in some way, but lines like him saying he'll "miss the sound of her voice" really seem to only be there for the "aww" factor. I guess I just found it to be besides the point. I also don't understand how him saying "I love you" somehow was able to disintegrate all her insecurities. I don't buy it, and it honestly doesn't even sound healthy. All that being said, I did truly enjoy the reflective parts of her book. Those parts really did shine, although they played a more minor role overall. The chapters where there was more reflective content stood out as more enjoyable for me, but this was probably because I didn't enjoy the story-telling. Halfway through, I realized that I didn't feel like finishing the book. I found myself just not caring anymore. I realize that must sound harsh. It was a logical decision more than anything else. The cons of the book outweighed the pros, and I would rather spend this time reading a book I would enjoy more. This book tries to be (1) a travelogue, (2) a Christian text on the will of God, (3) a self-help book on minimalism, and fails in all of them. As a travelogue, the descriptions of places are poor and few. Most states get no mention at all. Since the author is so self-absorbed, there is no time to share whatever she sees in the trip. Like a teenager, she only writes about her feelings. Of course, she travels in the easiest country on Earth, with a car, credit cards, cell phones, GPS and a net of supporters, but sounds like she is backpacking in Central Africa or Afghanistan. She thinks God is a genius in a bottle who is there for her every wish and desire. She bargains and cajoles Him for 300 pages! And her theology is poor...she practices Eastern yoga and swindles a car seller in $5000. God is there to help her find a parking spot or a husband, but what about obeying Him for a change? Don't expect to find any tips on minimalist living, either. She threw away what she could not fit in the car. She never did anything crazy...her house, her family , friends, were conveniently waiting for her at the end of the vacation. She even got her job back. I found Ally's blog through Twitter one time and her blog quickly became one of my favorites. I must admit that I really liked reading the stuff she wrote about dating, because I thought they spoke the truth, and not in a flowery way but in a real, age-appropriate, I-can-apply-this-to-my-life way. I was also very, very amazed at how she and her friend quit their jobs, sell everything and then went on a road trip to pursue their dreams. It's such an exciting thing, things that my friends and I ca I found Ally's blog through Twitter one time and her blog quickly became one of my favorites. I must admit that I really liked reading the stuff she wrote about dating, because I thought they spoke the truth, and not in a flowery way but in a real, age-appropriate, I-can-apply-this-to-my-life way. I was also very, very amazed at how she and her friend quit their jobs, sell everything and then went on a road trip to pursue their dreams. It's such an exciting thing, things that my friends and I can only think about. I mean, quit our jobs, sell everything and travel? It seemed hardly rational. When I heard that Ally was releasing a book about her adventures in this trip -- and one of the reasons she went on a road trip, I think -- I knew I wanted to read it. I find it funny that this book, like the previous non-fiction book I bought and read -- came to my life at exactly the right time, and it seemed like the words I read were the exact words I needed in my life. I make it sound so dramatic, I know, but it was the only thing that fits with my reading experience. Packing Light is a memoir of sorts, of Ally's trip with her friend Sharaya, and what she learned about baggage, be it physical or not. Ally talked about the preparations for the trip, her doubts, their adventures and misadventures. She talked about the relationships that she formed and lost and strengthened in the course of six months, how she dealt with heartbreak and how she found herself again. In each of the chapters, Ally would share the lessons she learned, and how she learned that in a trip -- and in life -- you can't take all the baggage that you have accumulated, but packing light isn't always as easy as it sounds. The best thing about books like this, I think, is its honesty. It helps that I knew Ally from her blog before, and her posts are just so real and honest that I knew her book would be nothing less. Packing Light has that same feel, the same kind of intimacy of a good friend who is telling you her story, and her adventures and you learn a thing or two from what she's saying. I liked reading about how she and Sharaya prepared for the trip, and then she puts it in such a way that anyone could be going through the trip, and the preparations. Ally makes it seem like anyone can do what she and her friend did...and maybe anyone really can. Perhaps not the same kind of trip, but still a trip that has a potential to change your life. Then again, every trip has a potential to do that, right? Needless to say, I loved Packing Light . I learned a lot while I was reading it, and I bet that if I reread it again, I will learn new things too. This is exactly the kind of book that I'd recommend to read if you're at a crossroad in your life, if you're having a life crisis, if you're feeling a little lost and broken and you don't want to be alone. But even if you're not in any of those states, I still think Packing Light is a must-read book. Ally's experiences teach us about what baggage can do in our life, and how important it is to let go. I picked up this book because I'm a minimalist and I thought it was actually about packing. Boy, was I wrong ;-) Instead, a beautiful story unfolded of two women taking big risks and setting off on a six-month adventure of a lifetime. Packing light is a metaphor and a philosophy (and an actual packing strategy) they learned along the way. I thought it was another i-discovered-myself-ona-fiddy-state-roadtrip-wifma-girlfriend memoir. Or maybe a minimalism book. But no, my friends. Ally digs through all kinds of baggage on her trip, and mostly spiritual and emotional. Not even necessarily bad baggage, but baggage with the question of What do I NEED to keep? what needs to go? Selfishness baggage. Overpreparation baggage. Control baggage. Disappointment baggage. There is stuff God wants you to let go of, yet there are things we really I thought it was another i-discovered-myself-ona-fiddy-state-roadtrip-wifma-girlfriend memoir. Or maybe a minimalism book. But no, my friends. Ally digs through all kinds of baggage on her trip, and mostly spiritual and emotional. Not even necessarily bad baggage, but baggage with the question of What do I NEED to keep? what needs to go? Selfishness baggage. Overpreparation baggage. Control baggage. Disappointment baggage. There is stuff God wants you to let go of, yet there are things we really should hold on to. The journey of her romance that began like an answer from God then fell apart was raw...and upset me enough to put the book down for months, as I was experiencing the same thing. But you know? I began to understand the baggage I needed to let go. And I deeply appreciate her honesty, not pretending it never hurt or bothered her again. This is a road trip book, the story of how Vesterfelt took a leap and went on tour with a friend as her roadie in all 50 states. I enjoyed the stories of exploring America, but I thought the metaphor of “packing light” got stretched a little thin. I also thought that too much of the story was about her writing the book. Recommended for: people who are thinking about what they carry with them, both physically and emotionally. I don't understand why this book didn't get a better rating. I loved it. It opened my eyes to do many things. I was in a funk when I started this book and it helped pull me out. I wanted to know where they were going next, how they got from one place to another, what their relationship statuses were, etc etc. I'm not a big religious person; more so a spiritual person, but I found this book inspiring. Interesting take on being a Christian and following God's plan. Many times I have felt that God was punishing me and forcing me to do something I was really afraid of. This book helped me to realize how unfounded those fears are. Considering this is a memoir with minimalism as a big element, I couldn't get invested in the author's story. I just didn't feel compelled to continue on and I am completely at peace with putting this off to the side. The place you start your journey is your anchor, the filter through which you process every single stop along the way. Our places shape us and teach us until, before we know it, we do not just live in a place. It lives inside of us. Your starting point matters when you go on a trip. It is your only frame of reference for what to bring, and what to leave behind. I grew up with a hunger to try to experience things for myself and make my own decisions. This sometimes got me into trouble in church, but it rarely stopped me. The collision of church and culture left me confused in many ways. We are all carrying baggage—things we’ve picked up at home, past experiences, expectations for what’s ahead. I hope it will encourage you to go on a trip. I couldn’t get rid of this nagging question in the back of my mind: What was I supposed to give my life to? “It’s just one little baby step at a time,” she continued. “If you try to figure out how to do everything, all at once, you’ll get overwhelmed. It isn’t until we believe in ourselves to do something radical that we invite others to believe with us. God doesn’t want us to be rich. Poor people have an easier time understanding their need for God, so Jesus doesn’t want this man to have nice things because his things get in the way of him loving God. I wondered if God was saying to me that if I let go of everything, I would find what I had always wanted. Embrace the unexpected, even if you’re not sure how it will turn out. The more stuff you bring with you, the more complicated everything gets. I want to be the kind of writer who is awake to the realities of heaven, but engaged in the realities of this world. I would give up anything to keep this feeling—the feeling of being close to Him. “That’s packing light,” I felt Him whisper, but it wasn’t so much of a voice as it was a deep reassurance from somewhere inside myself. Some of our best decisions are made on the fly, on instinct—without too much deliberation, without an elaborate pro/con list. After a while, it doesn’t matter who you’re traveling with—they just start to get on your nerves. Until we stop blindly following rules, we’re sleepwalking through our life. When we become who we were made to be, we come alive, but the people around us come alive too. If you want to experience a place, you have to experience its people, more than its landmarks, or restaurants, or ice cream, or history. You have to come into contact with the stories of the people who live there. Is it possible to pack light with people? Is it necessary? Is there ever a time when letting people go is the right answer? Fear is a self-fulfilling prophecy. We’re afraid so we act out of fear, and because we act out of fear, our fears tend to come true. Her confidence that everything was going to work out was contagious and irresistible. I wish I could have known my internal world was telling me lies about my external world and what was happening in it. If we believe God is a dictator, barking orders down from above, after a while we start to resent Him. I wasn’t sure what packing light lessons really looked like in my everyday life, but I knew I had to try. The journey had changed me. Sharaya had changed me. That’s what friends do, I think. Sometimes the luxuries we experience are as important to our journey as our discomfort. To say that the answer to living life to the fullest is just giving up all our stuff is giving our “stuff” way too much credit. When stuff becomes the point of our life, we miss out on the greatest blessing of all: the freedom we feel when we’re fully engaged in the push-pull of life, the letting go, and the holding on. You never know what will happen when you get out of the car, or out of your seat, and ask a question. It’s funny how the more responsibility you take for your actions, the more fun life becomes. God isn’t mad at us; He’s just waiting for us to wake up, to take responsibility, and to start living life with Him. He’s waiting for us to do something beautiful, something courageous, something totally out of the ordinary. Your whole life is an invitation. God isn’t going to tell you the “right” answer or force you in a certain direction, because if He did, He would only be stealing the joy that comes when you pick yourself. While the title intrigued me, this book fell short of the "promised" mark in so many ways. About 2/3 of the way through, it seemed to turn into a whine fest. I agree with the author's premise that God does not force you down certain paths; however, neither does he promise that you are not going to have to take up a cross in order to follow him. I kept waiting for insights on pairing down. And, the car seemed to be filled more and more with baggage on all levels...physically, emotionally, and spi While the title intrigued me, this book fell short of the "promised" mark in so many ways. About 2/3 of the way through, it seemed to turn into a whine fest. I agree with the author's premise that God does not force you down certain paths; however, neither does he promise that you are not going to have to take up a cross in order to follow him. I kept waiting for insights on pairing down. And, the car seemed to be filled more and more with baggage on all levels...physically, emotionally, and spiritually. I was confused with her dilemma of being known as a "Christian author." I wondered, for example, if C.S. Lewis wrestled with such things. While I believe she was stating that she did not want to be known as a niche author, this book is definitely of that genre. Hopefully, she touched base with her friends about her great revelations before she published her slant on the situations. I am not sure how helpful they were to the average individual and I would believe that they would strain friendships. Finally, it appeared that she was most satisfied when she had tangible evidence that she was successful. Big rooms in hotel for conferences, a trip to Alaska, and blog audiences. Would she be a failure as an author if those things did not come being? Surprisingly poignant. I picked this up thinking it would be a light travel memoir to entertain but expected little more. However, I found resonance in her graceful writing style and compassionately articulated philosophizing. Her voice remains with me several other books later, thrumming gently through my mind like a background of soft jazz — in tones that are improvisational, earnest, complex, and lovely. I hope the author continues sharing her personal journey with the world and knows that sh Surprisingly poignant. I picked this up thinking it would be a light travel memoir to entertain but expected little more. I thought the book was more introspective than expected but that was a good thing to me. I could relate to the author and gained something from her insights. The book is more about the mental and emotional baggage we carry than physical baggage. Cons: If you're looking for a book about travel, this book isn't it. There is a strong Christian message throughout the book that some might not appreciate. And obviously, the writer comes from a place of privilege to be able to take on such a trip in the I thought the book was more introspective than expected but that was a good thing to me. I could relate to the author and gained something from her insights. The book is more about the mental and emotional baggage we carry than physical baggage. I started reading this one because I thought it was going to be about minimalism, traveling, and maybe one-bagging, but I was sadly mistaken. This is one of those books that I spite-read all the way through, just so that I can legitimately say that I read the whole thing and stand behind my bad rating of it. It was suuper frustrating to read. This book didn't wow me but it was interesting. The author and a friend decided to take a road trip through all 48 states (and hopefully find a way to Hawaii and Alaska, too) and blog about it along the way. They experienced trials, joys, heartbreak, confusion, and hardship along the way. Oh, and they learned a lot about life, and about themselves. I appreciated how honest and vulnerable the author was in the book. I also appreciated her shared nuggets of wisdom. Traveling all 50 states is an amazing feat no matter the circumstances and the author and her friend did have some trials and triumphs. While some things could have gone a lot worse it wasn't all rainbows for them and the experience impacted them both in different ways. This book was a life changing read for me. I see many changes coming because I intend to apply the principles in this book. It is essential to hold lightly to our possessions and lean on the Lord to experience life to it's fullest. Old and young will be able to be inspired by this book!! I love Allison's (Ally) writing style, extensive use of dashes ' - ' and all. I got the feeling that there was so much more that she could of told, but allowed me to fill in the pieces nicely as she took me on her 6 month journey. Really enjoyed this book. In my own quest to downsize my things & change my attitude to one of more gratitude, I found her challenges on her road trip to reflect some of my own inner questions being voice. This book made me think hard about book reviews and their usefulness and short-comings. I bought this book largely because of the beautifully written, heartfelt review by Chad. He loved it and I was sure I would, too. Like Chad, I'm discouraged by how many Americans have bought into materialism and the horrible price we pay. Also, I have two young relatives who've announced that they're taking time off for an extended car/camping trip through the Western states. I'm thrilled for them, although some of their older relatives disapprove. Finally, it just sounded like so much FUN. Two young women traveling to all fifty states. I imagined that it would be chock full of hilarious stories. But one of the things that the author discovers on her journey is that events (and books) often turn out different than we expect and the "different" doesn't have to mean "disappointing" unless you're too rigid to accept the unexpected lessons that life has to teach us. This book was far different than I expected, but I'm glad I read it. Thanks, Chad. When I saw that it's published by Moody (a well-known Christian publisher) I was surprised, although not put off. I read many books by people of faith and my enjoyment isn't based on total agreement with their beliefs. Sadly, we seem to have become divided into a society that either refuses to read "Christian" books or refuses to read anything else. As the author points out, how can we bridge gaps unless we try to see how the other person thinks and feels? She has the "other-worldliness" (for lack of a better word) of people I've known who grew up in missionary families. I had to laugh at her dismay when she fears the reaction to her having spent the night in a hotel room with a man - both fully clothed and not sexually engaged in any way. By her lights, most of us should be crawling over hot coals to atone for our sins. And yet, she's a rebel in a mild way. She realizes that she's been a "rules-follower" ("pleaser" would be another way of putting it) all her life and begins to question the value of that attitude. "It's a very Christian idea that God has everything under control...." she writes. "I wonder if some times we take this as an excuse to do nothing." Iconoclastic words from a girl raised in a conservative, evangelical church. Some of her discoveries are ones that a old lady like me made long ago. Traveling (even for pleasure) is hard work. [Why I think young folks should travel BEFORE they settle down, not after they've "made it."] The maturity/wisdom/confidence that we associate with being an adult isn't automatically conferred on you on your 18th birthday, or along with your college diploma, your first real job, your marriage certificate or even the birth of a child. It comes from experience and that takes time. In a sense, this is a young person's book and I'm not a young person. What disappointed me the most is that I expected it to be a recounting of the nut-and-bolts of her saga and that never happened. She tells almost nothing about their preparation for the trip except that she was able to get her student loan payments deferred. The reader is left in the dark about her employment arrangements, how her roommate managed without her, or her parent's reaction to her trip. Apparently, planning for car repairs didn't enter into the preparation since a car break-down led to the hasty (and probably ill-advised) purchase of a new car. Another major problem is the almost total lack of humor. She refers to funny incidents, but seems to believe that her readers wouldn't be interested in hearing them. She has no talent for making you feel that you're taking a journey along with her. In other words, she's a good writer, but a lousy story-teller. I like both combined, but I'll settle for good stories told by someone who can't write very well. I got it on sale for 99 cents and I got far more out of it than that modest price. I enjoy reading about the lives of others, even if we don't have much in common. This young woman writes well and she's an admirable person, but I think she's short-changing herself as a writer. She feels that her writing is raw and personal, but I think there's more to her than she shows in this book. I hope that age and greater maturity will allow her to reveal herself more to the reader. I liked it, but I was prepared to love it. With a bit less concentration on her spiritual journey and a bit more on her physical journey, I think I would have. I wanted more... and less. I enjoyed the concept, but I wanted more of a transformation. Although, I suppose that's life. I also felt like the end dragged in the sense of momentum and length. I really enjoyed the author's candid and honest assessment of herself. I felt I was sitting down just having a cup of coffee with her getting to know her. And I could relate to her view of God. God is good and wants us all to experience a piece of heaven if we just get out of our own way. This book was truly inspiring ! This review has been hidden because it contains spoilers. To view it, click here. I'm disappointed in the ending. I felt like she went on the trip to improve herself and she actually became more self centered and whiny. Maybe that's real life. My name is Allison and I am a writer by profession, passion and necessity. The message has changed my life so dramatically, I’m passionate about helping others discover their own answers to the questions that ultimately inspired my trip. What do you really want out of life? What is getting in your way? I do this through writing, speaking and teaching (or coaching) other writers and dreamers. I have a My name is Allison and I am a writer by profession, passion and necessity. I have a degree in English and a Masters in Teaching, and I’m also the Editor-in-Chief of Prodigal Magazine, which I co-own with my husband. We live in Minneapolis, MN.